Los Angeles, CA — While movements like #OscarsSoWhite and #TimesUp have shed light on Hollywood’s issues with race and gender, no one is talking about its issue with the media … black media specifically. For years Black media has been marginalized and/ or taken for granted by studios, publicists and even talent. Be it being placed on the end of red carpets, not being invited to cover film and TV press days, or simply being told no because their audience is predominately African American. Over the years, it has become a rampant problem. *Have you ever wondered if there’s some memo you missed, or some “secret” you were not in on, when it comes to people recognizing your hard work, your business, heck…YOU! Well no matter what your calling is, on Thursday, April 12, you might want to put this unique breakfast workshop on your schedule. …and it only costs $25 (food included)! The Pasadena Chamber of Commerce’ Monthly Workshop Breakfast Series presents Dr. Marcia Ann Mims Coppertino; CEO of the Award Winning Consulting Group, Coppertino and Associates, to show you exactly what you need to know — and do — to UP YOUR GAME. Dr. Coppertino, the former General Manager for Cendent, parent company of Jackson Hewitt Financial and Tax Services, has trained 300 employees to become tax agents; under a 20 million dollar budget. She has opened over 40 offices throughout Southern California for business owners of the Jackson Hewitt franchise. With Dr. Coppertino at the mic, come and learn CATFISH MARKETING, MOONLIGHT NETWORKS, DEATH ROW PUBLICITY METHODS and MORE! Get off line and get in line to hear new ways of succeeding and branding your business as a number one player! 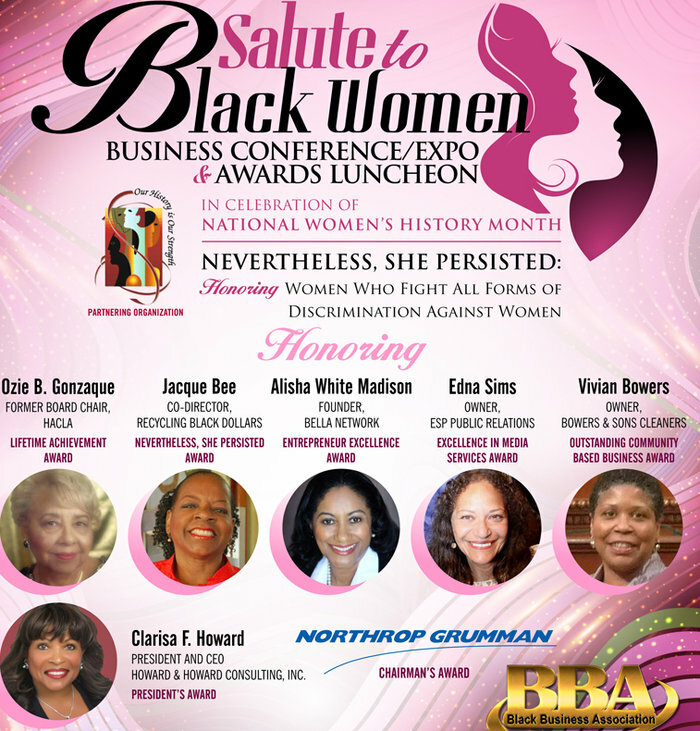 (Los Angeles, CA) – The Black Business Association (BBA), headquartered in Southern California and the oldest active ethnic business organization in the State of California, will host its annual Salute to Black Women Business Conference/Expo and Awards Luncheon on Saturday, March 24, 2018 at The L.A. Hotel in Downtown, Los Angeles at 333 S. Figueroa, Los Angeles, California. *Students who participate in Warner Bros. Pictures’ and New Line Cinema’s LIFE OF THE PARTY Premiere Promotion can help bring the party-and the movie premiere-to their city simply by showing they have more school spirit than their peers at other colleges across the country. *Los Angeles, CA – On April 12, 2018, the Los Angeles Unified School District (LA Unified) will host a Benefit Concert at The Music Center’s Dorothy Chandler Pavilion in Downtown Los Angeles. The Benefit Concert, presented in association with The Music Center, will feature A-List Performers who are committed to giving back to the next generation of artists. LA Unified student artists from selected schools will perform alongside celebrity guests. In addition, notable LA Unified alumni will join the festivities as hosts to advocate for arts education. The full roster of performers and hosts for the Benefit Concert will be announced when tickets go on sale mid-February. Los Angeles is one of the most vibrant, artistic and creative centers in the world. LA Unified’s Arts Education Branch (AEB) is committed to ensure that every school in the district provides arts classes, arts instruction, and arts experiences for every student in the district. ‘Black Panther’ Fans Get FREE Popcorn or Candy at El Capitan in LA Opening Weekend! Hollywood, California – Tickets officially now on sale at www.elcapitantickets.com, by calling 1-800-DISNEY6 and at The El Capitan Theatre box office for the presentation of Marvel Studios’ Black Panther February 15 to 25, shown in brilliant Dolby VisionTM Laser Projection & Dolby Atmos® Audio Technology. During opening weekend – Friday, February 16 to Sunday, February 18 — the public is offered a complimentary concession offer – Reserved ticket holders receive popcorn by showing the flyer (mobile device or printed); VIP ticket holders receive a complementary candy by showing the flyer. (Note: there is a limit of one complimentary item per ticket holder). Be the first to see the movie — on Thursday, February 15. The El Capitan Theatre will host a Special Opening Night Fan Event for Marvel Studios’ Black Panther at 6:00 PM. Admission is $35 per person, which includes: reserved seating, popcorn in a souvenir bucket, 20 oz. bottled drink and a souvenir poster. That evening will include prizes and more surprises! *It takes a village and Pasadena Playhouse — the official State of California Theatre — has stepped up to announce a new free ticket initiative called [email protected] The initiative will give access to thousands of area students, nonprofit organizations and social support entities to enjoy live theatrical performances at the Playhouse. The initiative, sponsored by Wells Fargo Bank, will invite those who may never have the opportunity to experience the transformative nature of theatre, to attend. These groups will be offered the Playhouse’s season programming, and attend on general performance dates. In addition to attending performances, participants will have access to post-show discussions and student workshops for select productions. Both will create a forum for analysis and greater engagement with play themes, topics, character development, and plot – encouraging empathy and understanding. This program can achieve a number of objectives from fostering greater awareness and appreciation for theater, to enhancing quality of life and strengthening community connections. And finally, the Pasadena Playhouse and Wells Fargo Bank can cultivate a larger community by creating meaningful relationships with participating groups. Current partnership schools include Pasadena Unified School District schools (Blair Middle and High Schools, Marshall Fundamental, Pasadena High School); Aspire Ollin University (secondary school), Aveson Charter School, California School for the Deaf, New Girls Academy, Northview Intermediate School, and Rosamond High School. Youth services organization partners include Asian Pacific Family Center, Glendale Youth Alliance, North Hollywood Jeopardy Program (LAPD), Teen Court Project for Justice, and T.Y.M.E. Foundation. Others include Day One, L.A. CADA, Lake Avenue Foundation, Los Angeles Red Cross Americorps, and Unusual Suspects Theatre Program.